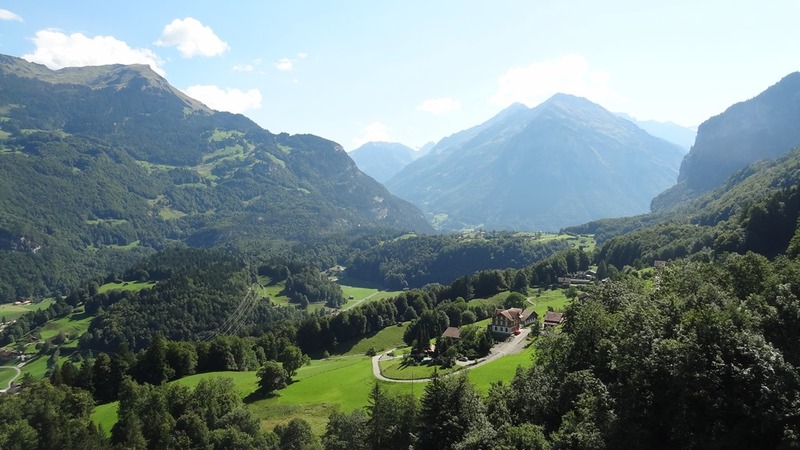 If you take a round trip from Meiringen, its only 131 km and should take no more than 3 hrs. of actual driving even on the slow mountain roads. As it would take us more than 2 hrs. to get to Meringen and I had a few stops in mind, I decided to do this over the weekend. Here is a picture-story of what we saw..
You remember when Sherlock Holmes and Professor Moriarty struggled over a fall and then fell over? Well, these are the falls!! There is a funicular close to Meringen which took us up to a very good viewpoint. From there we walked up a little till we reached another viewpoint and then took the funicular back down. This is the view of the valley from the top of the funicular. 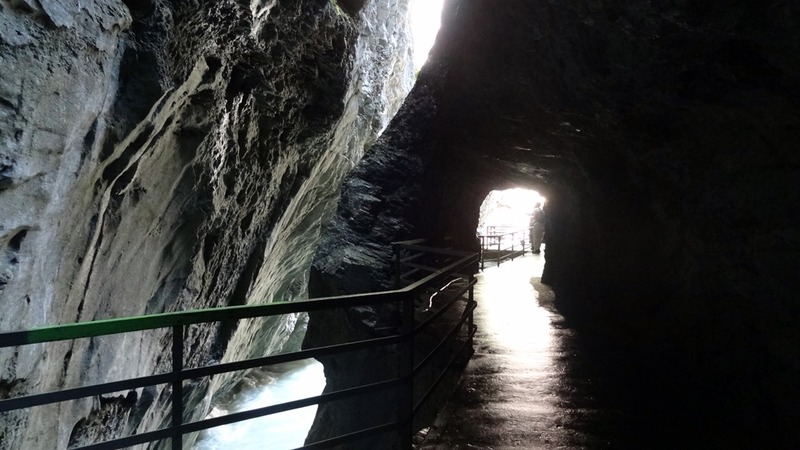 The entrance to the Aare Gorge is about a kilometre from the funicular to the falls, just across the highway. There is a walkway along the river which takes about 30 minutes each way. It is an easy walk, almost flat and wheelchair friendly. It is quite an extraordinary experience..the force of the river, the extreme narrowness of the gorge in places, the ‘wall’ of limestone looming very high at other places..I loved it! There were some great rock formations. The ‘mills’ were especially interesting. Also of interest was the entrance to military bunkers from WWII! 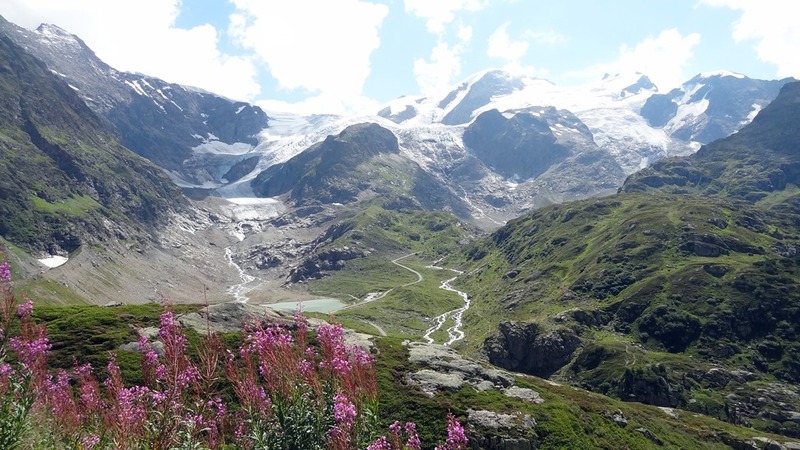 On the way to Susten Pass, there is a good spot for a great view of the Stein Glacier. 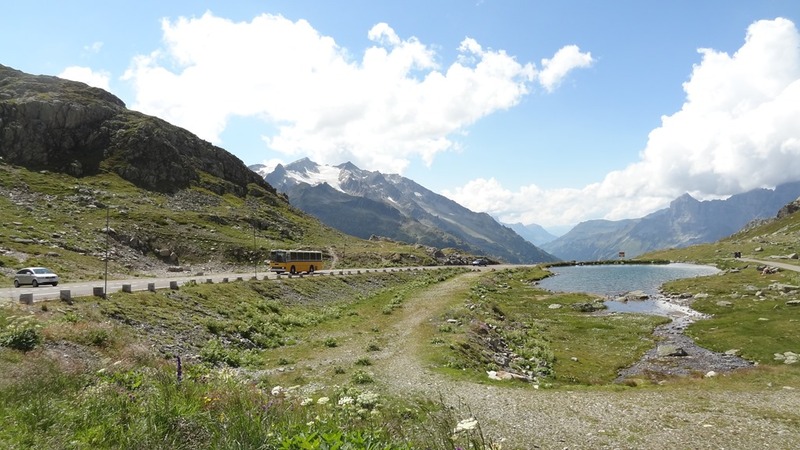 The Susten Pass at 2224m, with the famous Post Bus driving past. For those who don’t want to drive, this is an excellent alternative to go on this route. 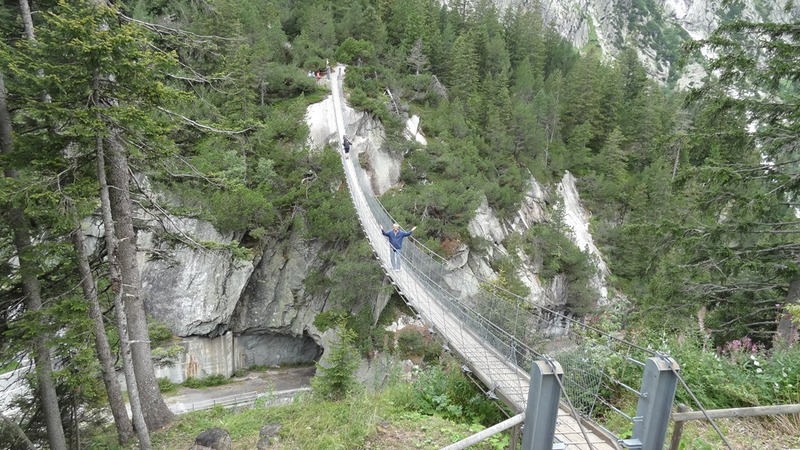 The Devil’s Bridge is right outside Andermatt. There is a nice story about it, you can read it here. 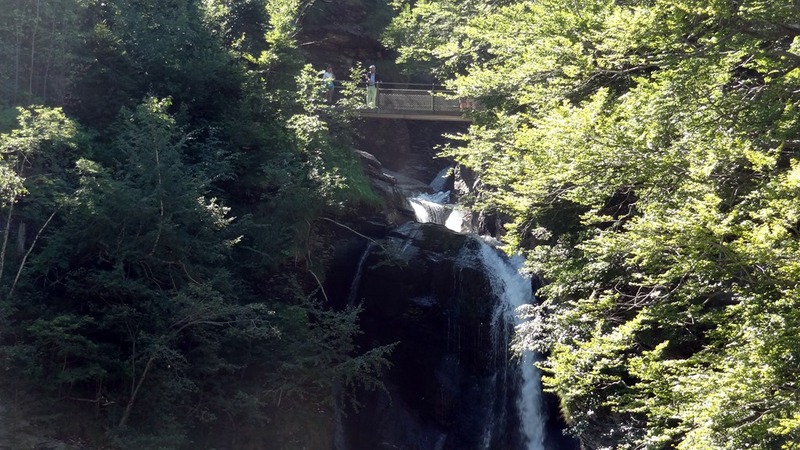 Once we cross this bridge above, there is a tunnel which takes you across to the other side of the waterfall. 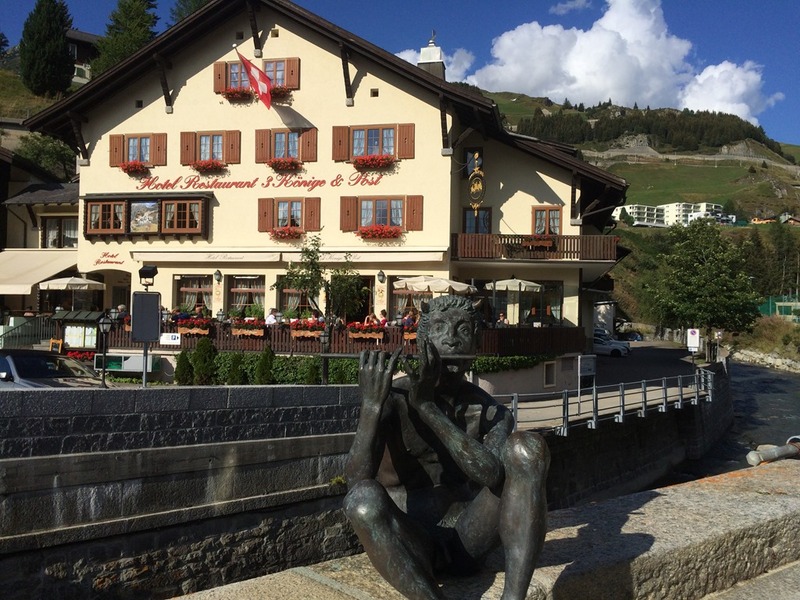 It was about 5:30 when we reached our hotel in Andermatt. We had a small wander through town, it was all rather quiet. After enjoying a leisurely meal, we called it a day. This spot is famous for its appearance in Goldfinger, the James Bond film! There is a video here of the car chase. 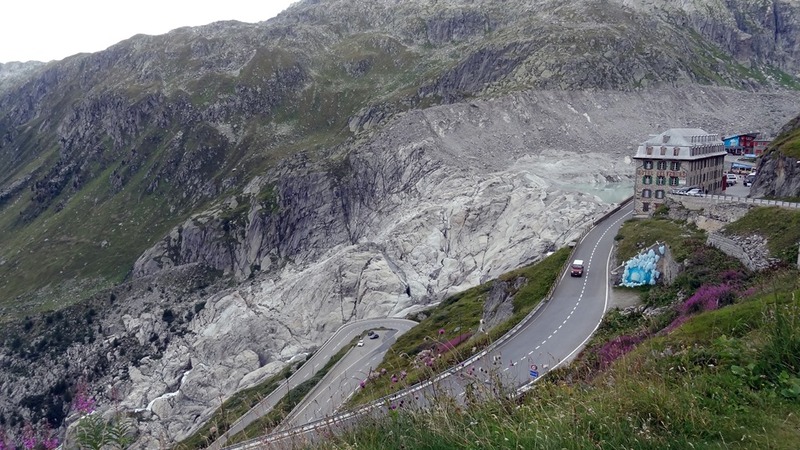 We continued on towards Furka pass by this marvellous route..beautiful at every point! 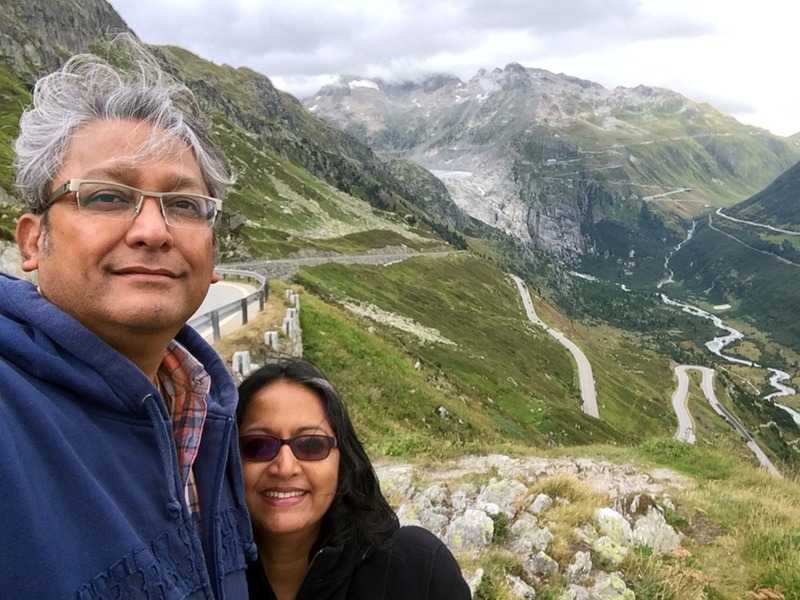 AT Furka pass – 2436 metres. There was a big flock of lambs passing through, it was fun to see them dot the landscape like so much fluff! The clouds looked threatening but thankfully it didn’t rain. I wouldn’t have liked to drive in these roads in bad weather. 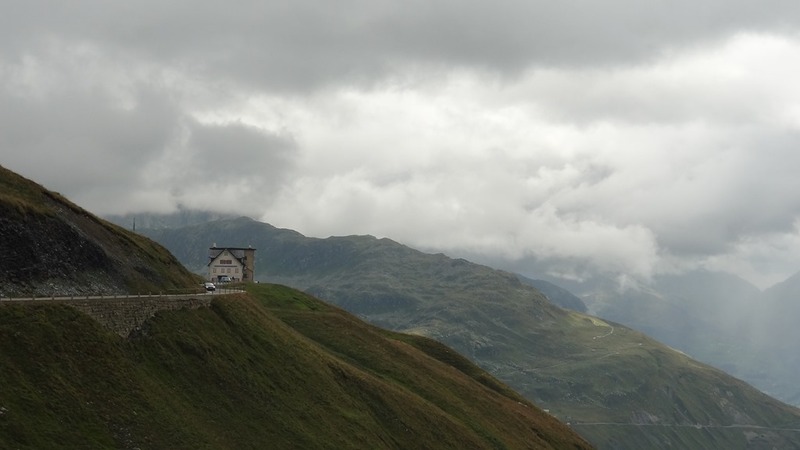 The Belvedere Hotel is quite near to the Furka Pass. 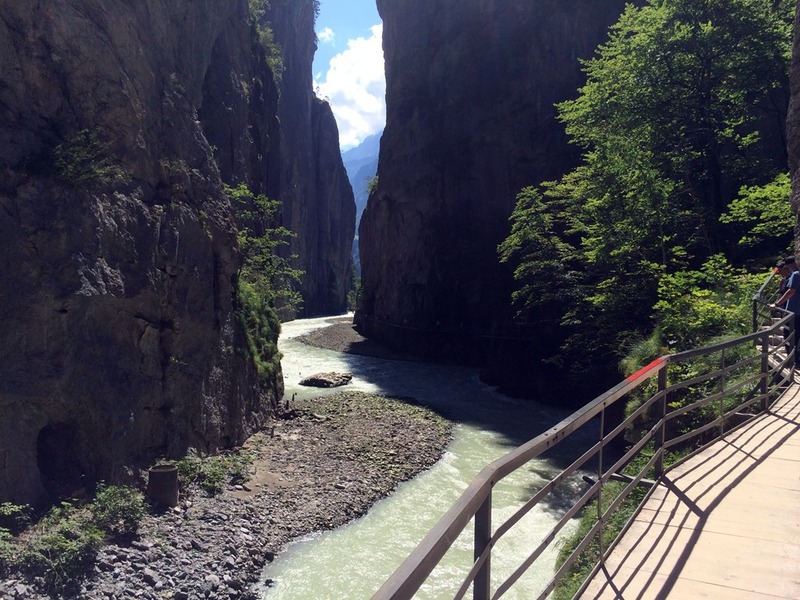 This is a great spot to see the Rhone Glacier, the source of the Rhone river which meanders its way through Europe. You can see the tip of the glacier beyond the hotel. The Rhone Glacier at the distant left. 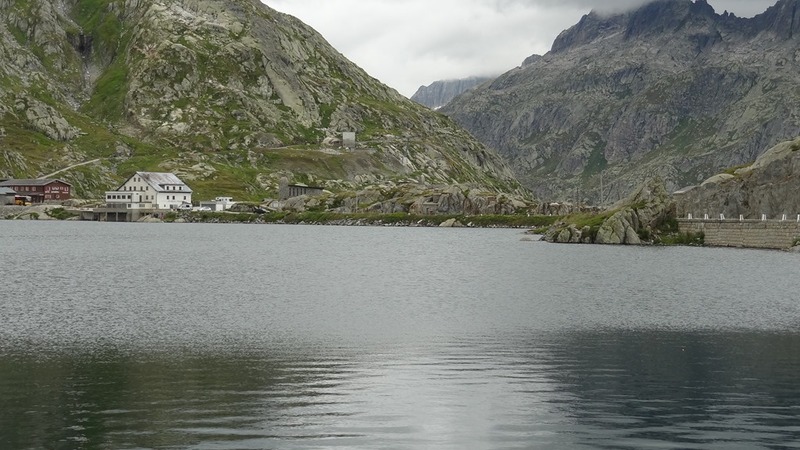 At the Grimsel Pass there is a small dammed lake. I saw some fishermen around too. 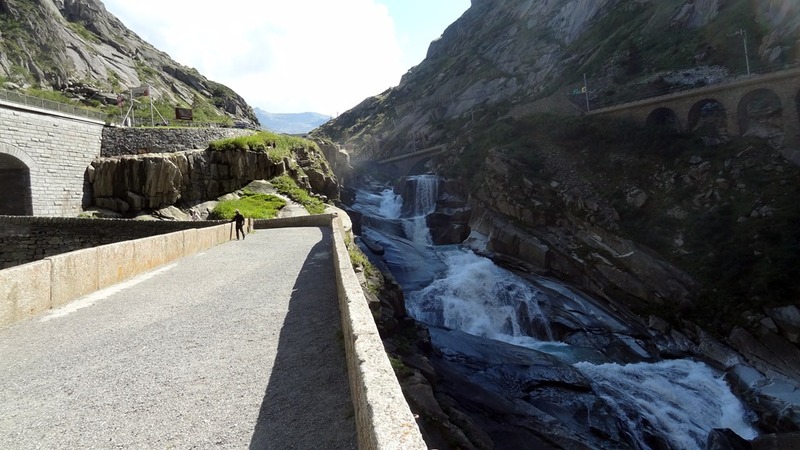 In fact, on the way down from the Grimsel, there are a number of dams and lakes. Our last stop was the Gelmer funicular. Right next to the base station there is the Handeck suspension bridge. I tried to cross it but lost my courage half-way through when it started swaying rather alarmingly! I also decided not to take the Gelmer funicular when I saw how very steep the climb was. That was the end of our trip. The drive was just fantastic and the views spectacular. An experience to remember!